Kyla Viereck, Spring High School FFA student, poses with Bud, her Grand Champion Steer, along with representatives of Phoenix Insulation who were top bidders in the live auction. 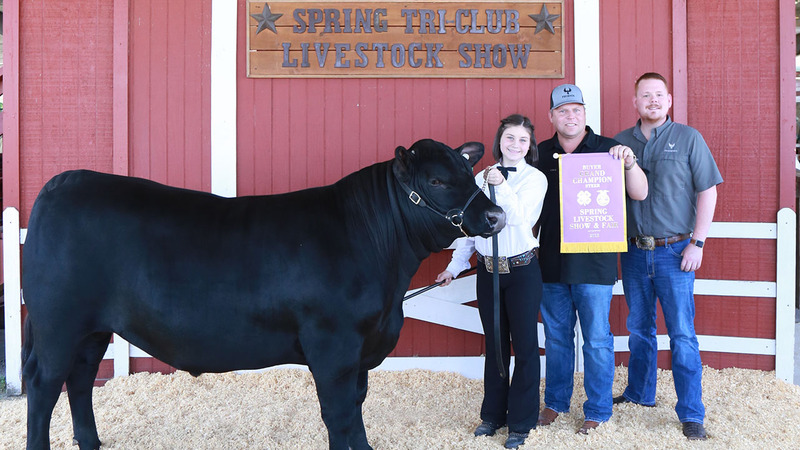 SPRING, Texas -- Kyla Viereck, a freshman at Spring High School, knew she had a good steer going into the show ring at the recent Spring Livestock Show and Fair, but as she waited anxiously for the judge's decision, she wondered if Bud was good enough. "I was trying to just stay calm and focused because my steer was acting up," Viereck said. "Everyone outside of the ring was cheering and very anxious, waiting. When he pointed to me, everyone screamed. I felt very happy, thrilled." That's when she knew, for sure, Bud was good enough. So good that he earned the coveted title of Grand Champion Steer, selling for $4,000 at the 67th annual event's live auction. Although Viereck is just a freshman, this was not her first show. Like so many of the 133 students who participated in this year's event, Viereck began raising and showing animals while in elementary school and a member of 4-H.
She joined Junior FFA while in middle school and is now a full-fledged FFA member with years of experience, not only showing animals but raising them as well. According to Marsha Cook, Spring Tri-Club president, the reward for those students involved comes not just during the show and fair, which is a fun-filled, often exciting, three-day event, but also from the months of hard work when students are learning commitment, dedication and responsibility. With a large animal, like Bud - Viereck affectionately describes him as a very big 1,335-pound baby - that meant two trips a day to the ag barn to make sure he was fed, watered and lodged in a clean, well-kept stall. This year the show raised over $103,000 for a variety of projects, including livestock, arts and crafts, welding and woodworking products, food, horticulture and photography. "Once again our employees, community members and business partners stepped up to show their support for our students," said Spring ISD Superintendent Rodney Watson. "Their generous donations to the Spring ISD Stampede buyers group made it possible for us to purchase several student projects, and the proceeds will directly benefit our students." Students involved in FFA, Family Career and Community Leaders of America and Spring 4-H often use their winnings for next year's projects and to put away for future college expenses. Additionally, the Spring Tri-Club, a 501(c)(3) organization that sponsors the event, uses funds raised at the fair to provide graduating seniors with scholarships.